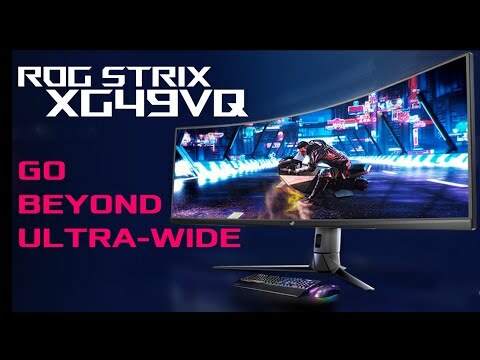 BE IMMERSED IN SUPER ULTRA-WIDE The ROG Strix XG49VQ is an incredible ultra-wide, 49-inch monitor perfect for immersive gaming. With a silky smooth 144Hz refresh rate along with Radeon™ FreeSync 2 HDR, and High Dynamic Range (HDR) technology for unmatched visuals. It offers an impressive 3840x1080 resolution with a VA panel type and a non-glare panel coating. You can also enjoy futuristic picture-by-picture technology which allows you to display multiple displays from separate inputs onto your monitor, along with useful hotkeys that allow you to alter the layout quickly and easily, making you the master of multi-tasking. The XG49VQ is packed with a range of features to always give you the best visuals, such as Shadow Boost, Blue Light technology, Flicker-Free technology and multiple HDR modes. It also offers robust connectivity options and has an ergonomically designed stand so you can enjoy this amazing display in total comfort. FUTURE-PROOF MONITOR SIZE MADE FOR EVERY TASK The 49-inch ROG Strix XG49VQ gaming monitor has an 1800R curvature and allows you to get the most immersive gaming experience along with extra flexibility for multitasking. With a 32:9 aspect ratio, the super ultra-wide display provides the same viewing area as two side-by-side 27-inch monitors without a gap and bezel restricting your view. The XG49VQ also features DCI-P3 90% professional colour gamut coverage and DisplayHDR™ 400 certification. SUPER-FAST 144HZ REFRESH RATE ROG Strix XG49VQ runs at an incredible 144Hz refresh rate, ensuring that even the most fast-paced games remain silky-smooth and completely lag-free, even when played at the highest visual settings. Experience playing your favourite games with unparalleled levels of detail, high-quality graphics and crisp text. DisplayHDR™ 400 certification The guarantee you’ll always have the best visuals, ROG tests every single monitor before it ships to ensure it passes the DisplayHDR™ 400 certification. To meet this standard, the peak luminance of ROG Strix XG49VQ is 450 cd/m2 which is 50% higher than typical standard dynamic range displays. This incredible monitor also delivers DCI-P3 90% colour gamut and contrast performance, to deliver the best HDR experience. RADEON FREESYNC™ 2 HDR Incredible Radeon FreeSync™ 2 HDR technology delivers smooth, seamless visuals with low latency and better brightness and contrast. FreeSync 2 stipulates low-latency processing for both standard and HDR content, eliminating input lag and screen tearing. MULTIPLE HDR MODES Choose from multiple HDR modes in order to adjust monitor performance to cater to whatever task you’re completing. Whether it’s watching, creating or playing games. You can optimize HDR performance on an AMD graphics card with FreeSync 2 HDR. FLICKER-FREE TECHNOLOGY The majority of monitors on the market make small flickers that aren't noticable to our eyes. However, these flickers can cause strain and damage our eyes. ROG Strix XG49VQ uses flicker-free technology to reduce on-screen flickering to minimize eye strain, providing a more comfortable gaming experience. PICTURE-BY-PICTURE TECHNOLOGY With its super-ultra-wide screen, multiple inputs and picture-by-picture support, ROG Strix XG49VQ allows you to watch up to three content sources at the same time, so you can play on your console and watch streams or videos on your PC all on the same screen, giving you seamless productivity. Picture-by-picture technology also provides convenient hotkeys so you can quickly display different video sources side by side in seconds. ASUS GAMEVISUAL TECHNOLOGY You can use up to six pre-set display modes for various types of games, this provides optimized visuals with GameVisual ASUS-exclusive technology, so you'll always have the best picture for each task. Racing mode Racing mode reduces input lag, making it ideal for fast-paced racing games when G-SYNC technology is on, so you'll never miss even a millisecond of the action. Cinema mode Cinema mode cools and saturates colours to give you a more immersive and cinematic viewing experience. RTS/RPG mode Enhances colour saturation and contrast sharpness to give you better, brighter colours and detailed visuals for real-time strategy (RTS) or RPG games. FPS mode FPS mode also enhances colour saturation and contrast sharpness to give you more real-to-life, brighter colours for pristine details even during fast-paced battles. sRGB mode sRGB mode is perfect for surfing the web or editing photos. Get accurate, realistic colours and enjoy perfectly accurate imagery. Scenery mode Scenery mode provides more contrast gradations, makes grass greener and skies more blue. This mode is ideal for slideshows and presentations as it gives vibrant and detailed visuals. ASUS APP SYNC App Sync allows you to assign specific ASUS GameVisual modes to individual applications and games to make sure the program you are using is in your preferred mode. PROTECT YOUR EYES FROM HARMFUL BLUE LIGHT This ROG Strix monitor comes with TÜV Rheinland-certified ASUS Ultra-Low Blue Light technology that reduces the amount of blue light emitted by the display, and features four different settings onscreen to suit each task. These can easily be accessed via the OSD menu or using the five-way joystick. SHARABLE DISPLAY SETTING PARAMETER All customized GameVisual settings can be saved to an AXML file format than can be shared with other users with the same monitor. ASUS Shadow Boost Shadow Boost technology clarifies dark areas of game worlds without overexposing the brighter areas. This improves overall viewing whilst making it easier to spot enemies hidden in dark areas. WITH SMART CABLE MANAGEMENT ROG Strix XG49VQ provides a wide selection of connectivity options, including DisplayPort 1.2, Two HDMI ports and two USB 3.0 ports, all discreetly hidden for a sleeker design.